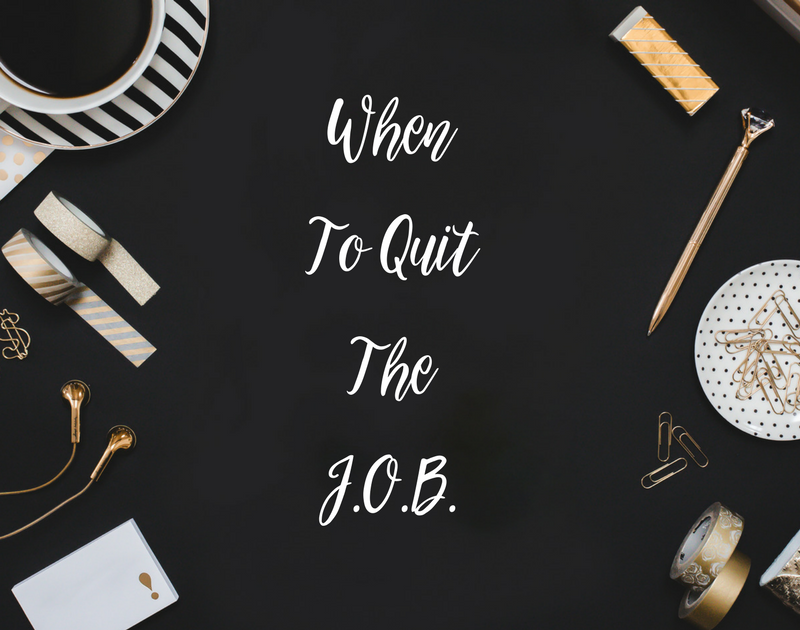 When To Quit The J.O.B. Many entrepreneurs face this problem… when to quit the 9 to 5 life. Leaving security and a guaranteed income to jump into the unknown can be terrifying. Friends will tell you you’re crazy and your family will urge you to keep the regular money flowing in (for their sake more than yours) … but you know in your heart of hearts that if you don’t pursue your passion, you’ll never be truly happy. So how do you know when it’s the right time to quit? Have you considered that perhaps it doesn’t have to be so brutal and final as that? Many people use the excuse “but I have a full time job, I don’t have time to work on my business, I’m too tired”. Hun, you’re not tired, you’re uninspired. If 40 hours a week makes you tired, you’re better off staying in that JOB. You DO have time. Make time. Give up TV, it’s only brainwashing you anyway. Pre prepare all your meals so you can save half an hour a day (at least) mucking around in the kitchen. Get up half an hour earlier and commit your lunchtime to business development, and not getting the ‘crucial lunch time pint’ in at the pub with your colleagues. Having a life is important, balance is just as crucial to your success as forecasting and strategy, BUT you could leave the party an hour earlier than you normally would to avoid the hangover AND get up an hour earlier the next day. The point is, it is perfectly possible to create windows of opportunity where you can fully commit to developing your business and getting in your first client, way before you even have to consider breaking up with your boss. Once you have the first couple of clients in you can implement the power of referral and testimonial to bring the next few in, and you can attend to these clients on evenings and weekends and in those windows of opportunity you’re now well disciplined in creating!! Once your client base becomes unmanageable during your ‘inbetween times’, it’s time to REDUCE your hours in employment. Note the key word here… you don’t need an extra 40 hours a week to handle 1 or 2 extra clients or the increased marketing strategies you want to roll out, so talk to your boss about becoming part time instead of full time. And, like any good business plan, roll this strategy out and gradually reduce your hours until it’s bye bye JOB and hello full time entrepreneur!! Now it doesn’t seem so scary does it? Go create your windows of opportunity, it’ll be one of the best decisions you ever made!